An old woman has reportedly burned the hands of her own granddaughter with hot coals in an Osun community over some food. 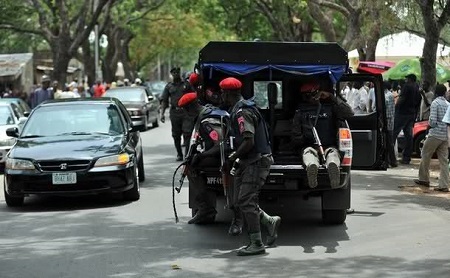 The Nigeria Security and Civil Defence Corps, Osun Command, says it has arrested a woman who allegedly burnt the hands of her nine-year-old granddaughter for eating her brother’s food, Punch Metro reports. The Public Relations Officer of the command, Mr Babawale Afolabi, disclosed this to newsmen in Osogbo on Wednesday. Afolabi said the incident occurred on Jan. 16 around 1:45 p.m., at Ila Area of Erin-Osun, Osogbo, where the girl was living with her grandmother, Victoria John. He explained that the girl, who lost her mother at a tender age, was caught by her grandmother eating her twin brother’s food and was subsequently punished by burning her hands with hot coal. He said the girl was taken to the Primary Healthcare Centre at Erin-Osun by some residents for treatment. The spokesperson said the residents later reported the case to the Human Trafficking and Child Abuse Department of the corps. He said medics that were treating the girl said that she needed surgery to repair the contraction on the hands. According to him, based on the level of damage inflicted on the hand, the victim will also need a psychotherapist to help her with proper use of the hands again. Afolabi said the grandma was presently in the custody of the NSCDC, adding that further investigation into the matter was ongoing.